In Italy, enjoying a delicious meal of wholesome foods with family and friends is an integral part of each person's life and well being. Italians make time everyday to celebrate life through this ritual. Homemade egg pasta literally unifies Italy, a country with very different regional cuisines. 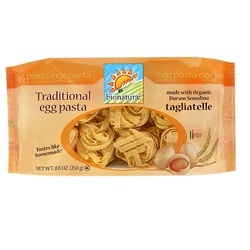 bionatur_¬ Traditional Egg Pasta is the very replica of the Italian mother's homemade pasta. It is made with certified organic semolina durum flour and certified organic eggs, from our own flock of pasture-raised hens. Make every meal a special occasion with this Old World treat!